What would happen today if an asteroid the size of that which did in the Dinosaurs and 9 species in 1o 65 million years ago were to hit Earth today? What would happen if a small band of survivors came face to face with the enigmatic myth that is Sasquatch? 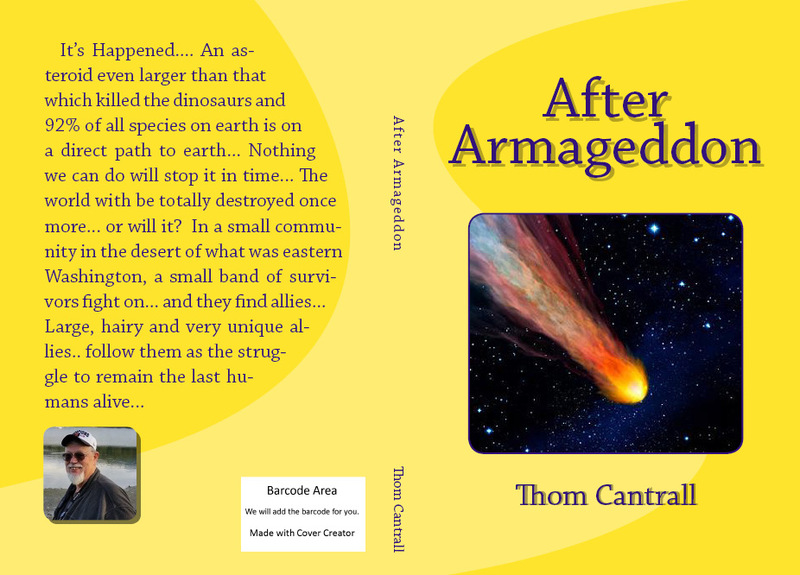 Many millions of years ago disaster was headed towards an unaware and unwary world. This world was heavily populated with many diverse creatures large and small. Their world seemed to them to be stable and would endure forever, for had it not endured since the beginning of their memories? There was a hierarchy of sorts that ruled this world. It was a hierarchy of the strong and the wise and in a clash of those two, generally the strong will out for truly, in the world of the blind, is not the individual with one eye the king? heavily populated world would no longer exist! We can assume that this rock was huge. This rock was the size of the largest mountain standing on our world today. Had man lived on this world at this time he would have seen a brilliant, burning light in the sky as the rock hurtled through the atmosphere of that world and was heated beyond white-hot by it. This spectacle would have been visible across much of this world and would have, no doubt, scared him catatonic… but not for long. There was no man on that world at that time and there was no record written of it with pen and paper but, it happened. It is written in the rocks if not on paper on that world. When this giant mountain hurtled out of space, I’m sure that myriad eyes turned heavenward and watched it as it sped to his destiny at the edge of a great ocean where it struck with such force and power that we can only imagine it today from our safe distance and separation in time. When this rock struck, the explosion was greater than any human has ever seen. The fireball was so immense it immediately incinerated everything in a huge circle many miles across. These were probably the luckiest of its victims in this cursed world for the explosion ripped and pulverized billions of tons of the native soil and stone and sent a cloud of near flour consistency particles around the world, obliterating the sun and creating an unending night that would last beyond the lives of most of the population of this world. Now, all at an instant, size and power mattered not a whit. The large and the powerful were destroyed as quickly and as readily as the weak and the timid. Around this world, the sun was not to be seen… it was winter with no plants growing. The herbivores were starving now and with them went those who preyed on them. The giant and the intelligent and the stupid… the wise and the vapid… predator and prey… it mattered not how large, how mean, how strong or how well endowed… all were doomed. These creatures were not just some individuals but entire species all over this world were doomed It was not just a few species or some select species that were doomed, but virtually every species that lived on the surface of this ancient world were to disappear in the mere twinkling of a geological eye. Only those species that could escape the surface of this now barren, cold and deserted planet had any chance of surviving. Those that did not rely on the myriad surface species for food, shelter or survival had a chance. holocaust. There may have even been some avian species that were able to live on, but the survivors were few and they were scattered widely as food was nowhere plentiful.